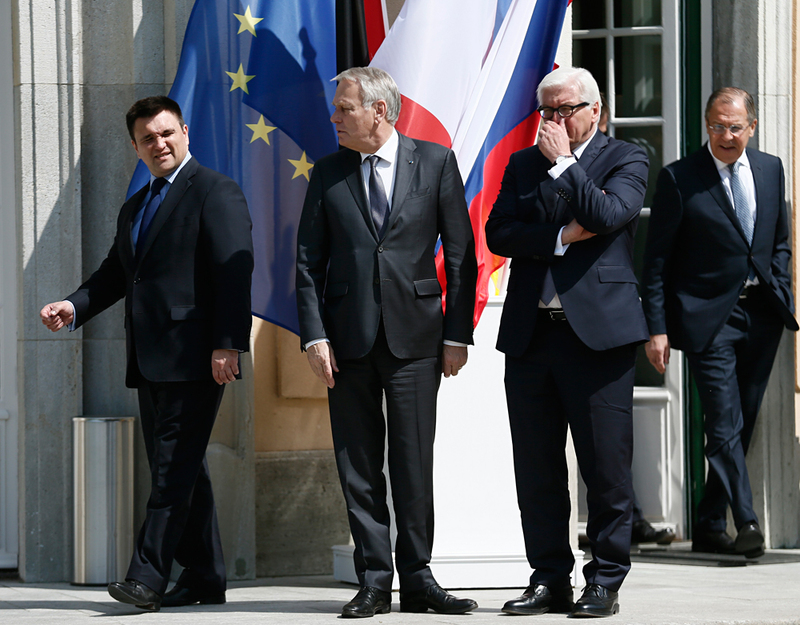 Foreign ministers Pavlo Klimkin of Ukraine, Jean-Marc Ayrault of France, Frank-Walter Steinmeier of Germany and Sergei Lavrov of Russia (L-R) arrive to pose for a picture outside German foreign ministry's guest house Villa Borsig in Berlin, Germany, May 11, 2016, ahead of their meeting to discuss Ukraine crisis. Steinmeier says situation in Donbass keeps deteriorating. Paris and Berlin are preparing a meeting of the foreign ministers of France, Germany, Russia and Ukraine to be held in the Belarusian capital Minsk on Nov. 29, German Foreign Minister Frank-Walter Steinmeier, said speaking in the Bundestag (German Parliament) on Nov. 23. "Last week, my French counterpart [Jean-Marc] Ayrault and I offered our Russian and Ukrainian counterparts to meet again in Minsk on Tuesday," he said. According to Steinmeier, the situation in the Donbass has deteriorated over the past few days, whereas the number of ceasefire breaches has grown. "Even if we are unable to achieve a breakthrough, such negotiations are necessary to make sure that the situation does not spiral out of control," Germany’s top diplomat said. "Even if it is difficult and the work is progressing very slowly, we should not abandon step-by-step implementation of the Minsk agreements," Steinmeier said. Steinmeier expressed hope that his "Russian and Ukrainian counterparts assess the seriousness of the situation in a similar way." "Both parties should finally make a visible contribution to the long-term settlement of the conflict in Ukraine," Steinmeier said.